The Chicago Police Department threw cold water on reports Thursday night that "Empire" actor Jussie Smollett staged his own attack in response to his character being written off of the show. "Media reports anout the Empire incident being a hoax are unconfirmed by case detectives," CPD spokesman Anthony Guglielmi tweeted. "Supt Eddie Johnson has contacted @ABC7Chicago to state on the record that we have no evidence to support their reporting and their supposed CPD sources are uninformed and inaccurate." A CBS reporter also tweeted the theory, citing "top sources." A statement from 20th Century Fox Television, which produces "Empire," also denied that Smollett was being taken off the show. “The idea that Jussie Smollett has been, or would be, written off of EMPIRE is patently ridiculous," it reads. "He remains a core player on this very successful series and we continue to stand behind him." Police said earlier in the day they have identified two persons of interest in the alleged attack on "Empire" star Jussie Smollett. Guglielmi said the two persons of interest were picked up at O'Hare Airport Wednesday night and were being questioned as of Thursday morning. "After a meticulous investigation with the use of advance technology, interviews with the victim and witnesses and transportation records, detectives have identified two persons of interest in the Empire cast member case," police said in a statement. 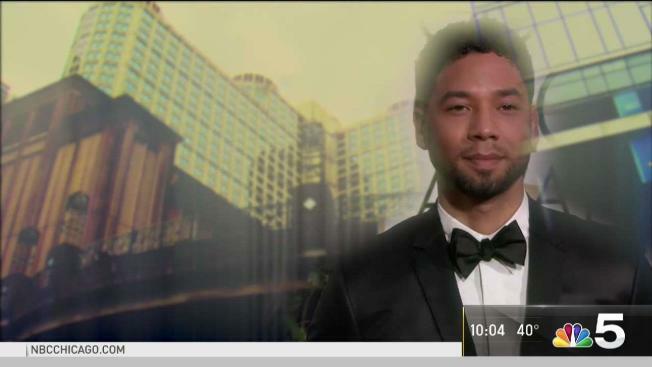 The latest development comes on the same morning Smollett's first television interview since the alleged attack aired. “We are pleased there is progress in the case and are waiting to hear further details," a spokesperson for Smollett said in a statement. Smollett told police on Jan. 29 that two masked men punched him, subjected him to racist and homophobic insults, threw an "unknown chemical substance" on him and put a thin rope around his neck before fleeing. Smollett's account to detectives included that his attackers yelled that he was in "MAGA country," an apparent reference to the Trump campaign's "Make America Great Again" slogan that some critics of the president have decried as racist and discriminatory. The alleged attack occurred in the 300 block of East Lower North Water Street about 2 a.m. as the actor returned home from an early-morning visit to a Subway restaurant, according to the police report. Smollett said in the interview that he was left in shock after the incident and inititally didnt want to report it to police. "I was looking at myself, just like checking myself out. I saw the bruise on my neck, you know, like the little -- the rope burn around my neck," he said. "So when the police came I kept the clothes on, I kept the rope on me... I mean, it wasn't, like, wrapped around. But, yeah, it was around because I wanted them to see." Smollett said he's "pissed off" not just by the attack itself but by those questioning his story. "For me, the main thing was the idea that I somehow switched up my story, you know? And that somehow maybe I added a little extra trinket, you know, of the MAGA thing," Smollett said. "I didn't need to add anything like that. They called me a f-----, they called me a n------. There's no which way you cut it. I don't need some MAGA hat as the cherry on top of some racist sundae." The Chicago police report lists the weapon in the alleged attack as "hand, feet, teeth, etc." "He is a victim," Chicago police Supt. Eddie Johnson recently said of Smollett. "And we treat him like a victim. He's been very cooperative." Hours of surveillance video from multiple cameras in the area where Smollett says the attack happened have been reviewed. Smollett handed over redacted phone records to Chicago police Monday, but authorities said the records "do not meet the burden for a criminal investigation as they were limted and heavily redacted." A representative for Smollett said the redacted records were to protect the privacy of his contacts. "They wanted me to give my phone to the tech for three to four hours. I'm sorry but -- I'm not gonna do that," Smollett said in the interview. "Because I have private pictures and videos and numbers: my partner's number, my family's number, my castmate's number, my friends' numbers, my private emails, my private songs, my private voice memos." Only one image has been released of possible "persons of interest." "I don't have any doubt in my mind that that's them," Smollett said. "Never did."